See in Glossary setting that allows you to dynamically scale individual render targets, to reduce workload on the GPU. In cases where the application’s frame rate reduces, you can gradually scale down the resolution to maintain a consistent frame rate instead. Unity triggers this scaling if performance data suggests that the frame rate is about to decrease as a result of the application being GPU-bound. You can also trigger the scaling manually by preempting a particularly GPU-intensive section of the application and controlling the scaling via a script. If scaled gradually, dynamic resolution can be almost unnoticeable. Unity supports dynamic resolution on Xbox OneMicrosoft’s eighth generation video game console. See in Glossary, PS4Sony’s eighth generation video game console. See in Glossary/tvOS (Metal only), Android (Vulkan only), Windows Standalone and UWP (DirectX 12 only). With dynamic resolution, Unity does not re-allocate render targets. Conceptually, Unity scales the render target; however, in reality, Unity uses aliasing, and the scaled-down render target only uses a small portion of the original render target. Unity allocates the render targets at their full resolution, and then the dynamic resolution system scales them down and back up again, using a portion of the original target instead of re-allocating a new target. When you enable Allow Dynamic Resolution on the Camera, Unity scales all of that Camera’s targets. You can control the scale through the ScalableBufferManager. The ScalableBufferManager gives you control of the dynamic width and height scale for all render targets you have marked for the dynamic resolution system to scale. As an example, assume your application is running at a desirable frame rate, but under some circumstances the GPU performance decreases, due to a combination of increased particles, post-effects and screen complexity. The Unity FrameTimingManager allows you to detect when the CPU or GPU performance start to decrease. So you can use the FrameTimingManager to calculate a new desired width and height scale to keep the frame rate within your desired range, and bring the scale down to that value to keep performance stable (either instantly or gradually over a set amount of frames). When the screen complexity reduces and the GPU is performing consistently, you may then raise the width and height scale back to a value that you’ve calculated the GPU can handle. This example script demonstrates basic use of the API. 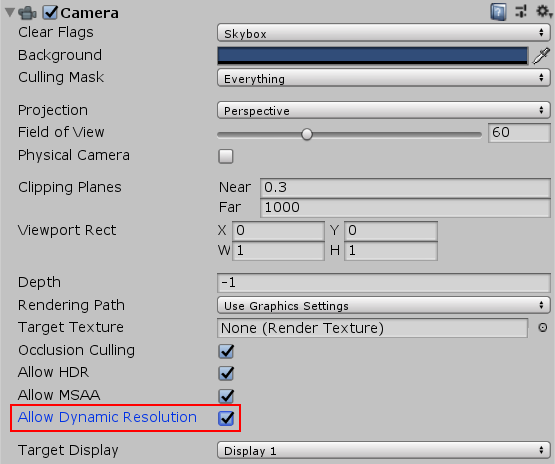 Add it to a Camera in your Scene, and check Allow Dynamic Resolution in the Camera settings. You also need to open the Player settings (menu: Edit > Project Settings, then select the Player category) and check the Enable Frame Timing Stats checkbox. Clicking the mouse, or tapping the screen with one finger, lowers the height and width resolution by the amount in the scaleWidthIncrement and scaleHeightIncrement variables respectively. Tapping with two fingers raises the resolutions by the same increment. // Estimate the next frame time and update the resolution scale if necessary.